Isn’t it frustrating when you try to twirl spaghetti but it falls? Especially when you have a company(ies) at a table, it is awkward that you already opened your mouth for a fork full of noodle but nothing on the fork, so you have to begin to twirl again. “Calamete,” a unique hand like noodle fork helps you eat your spaghetti smoothly. The name “Calamete” refers “karamete” meaning “entwine” in Japanese. 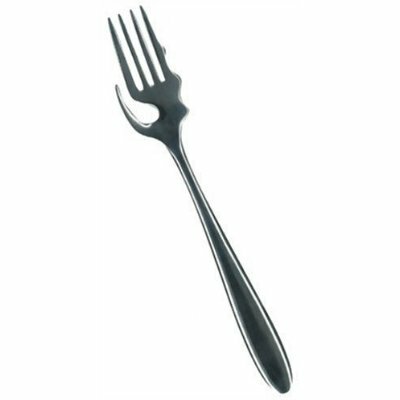 As you can see in the picture above, the characteristic of the fork is the thumb like tine, which prevents noodle slipping off. Also there are bumps on a side of a tine to help hold noodle. This is how it works, you get noodle with the thumb first, and then twirl like usual. It is invented by a Japanese company, SANYO Precision, and sold online stores such as Amazon and Tokyu Hands at 880 yen (US$10). It is called “pasta fork” but it must be perfect for ramen or any kind of noodle too. Announcement of the Winners of Japanese Scarves and Mufflers !! !